Bidossessi 3 is a group of 4 people whose members live in the same district. 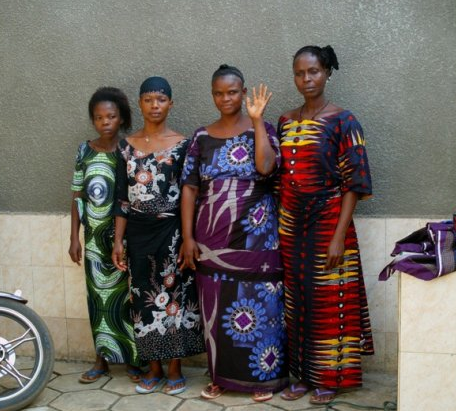 The group's representative, Régina (who is raising her hand in the picture), is 41 years old and doesn't live with her husband any more. Régina is the mother of 3 children, some of whom attend school and one of whom remains under her care. Régina lives alone with the child she is raising and meets the child's different needs by herself, thanks to the income she gets from her business. Régina has been selling clay ovens for nearly 10 years. She also sells maize and soya porridge in her area. She gets her supplies in Benin. This is the third time that Régina and the other group members are requesting the financial support of ALIDé in order to increase their working capital and strengthen their businesses, so that they can better respond to their customer demand. The 2 previously received loans have been properly repaid. Congratulations to the Bidossessi 3 Group..!